Buckle up! This is a good one and figure friendly too!!! This would also be great with ground turkey instead of chicken! ***If you like it spicy add Sriracha and or hot sauce at this point too! ***You can add other garnishing like diced green onion or fresh parsley or cilantro on top-I just didn’t have any on hand! Combine ALL ingredients together and mix well in baking dish. 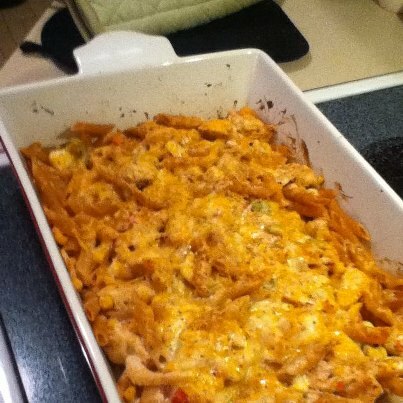 Top with 1/2 c shredded cheese of your liking. Bake at 385 degrees for 30 min. Serving size should be 1 1/2 cups. Great to make for dinner and have for leftovers the day or even two! Posted on March 1, 2013 March 1, 2013 by awesomelikeadriennePosted in EatTagged bake, chicken, cilantro, dinner, easy, healthy, Mexican, onion, pasta, penne, pepper, salsa. oooh this looks absolutely delicious! I love mexican food 🙂 I definitely would make this spicy.